https://growgather2eat.files.wordpress.com/2015/08/nature-now223-81915-plants-and-drought.mp3Here is a transcript from a local radio show. Debaran Kelso, host of Nature Now interviews me about the drought and gardening with natives. DK: I heard that this year is our driest in 64 years, and that the Olympic Peninsula is experiencing severe drought. Our native plants are adapted to dry summers and wet winters, which is the definition of a Mediterranean climate, but it’s hardly ever THIS dry and warm! What are the first indications that a plant is undergoing water stress, Jeanmarie? JM: Some native plants started wilting a month ago, some plants have leaves that are brown or scorched along the leaf margins, or even turning yellow and dropping prematurely. If we have several years of drought the plants can get so stressed that they will be prone to disease and possibly die if not given attention. DK: What are the broad categories of plant type that we have in our area, and are some of them better than others at being adapted to drought? JM: Well we have trees and shrubs, both evergreen and deciduous. Both types loose leaves, by the way, deciduous ones just drop them all at once in the fall. Evergreens loose their leaves slowly all year and always have enough that they look green. When people hear the word “evergreen”, they automatically think of conifers like Doug fir and cedar, but here in the PNW evergreen can describe broadleaf trees and shrubs. DK: Broadleaf just means flat wide leaves such as maples and oaks. JM: Right. We have beautiful evergreen broadleaf plants like madrone, rhododendron, and salal. In fact these plants are considered choice ornamentals in England that has similar maritime climate. So our native plants include trees, shrubs, groundcovers, herbaceous perennials, ferns, and annuals. DK: Would you describe how plants lose water? JM: On the outer surface of leaves are tiny structures called stomata. Plants breathe through these pores and release moisture that is pulled up from the roots. If you have noticed a squash plant in the middle of the day this summer, it can be totally wilted and then come back to life in the evening. The pores on the leaf let out moisture. Now, as you mentioned earlier, our dry summers and mild wet winters are characteristic of a Mediterranean climate. DK: Don’t forget evergreen huckleberry and beach strawberry! And the succulent leaves of sedum. JM: Right. Also deciduous plants have ways to reduce moisture loss, grey foliage plants have fine hairs that give it that color. You can notice the gray under side of leaves like Scouler’s willow when the wind blows. DK: What can we do, in general, to help our plants cope with our current lack of rain? JM: First we have to rethink watering. Quick light sprinkling will not get water to the root zone of most plants. Frequent shallow watering leads to shallow roots; shallow roots in turn leads to more rapid stress under drought and hot conditions. Deep infrequent watering leads to roots growing deep. Always check soil after watering. Use a trowel or your finger; soil should be moist 3” deep. Overhead watering is a luxury in a drought it is inefficient, some water blows away. The little bit of rain we’ve had might enter plants through their leaves but we need the roots to get a good soaking. DK: Drip irrigation is a really good way to go, isn’t it? JM: Yes! It’s great if you are able to make the commitment to convert the garden to drip irrigation. In the long run you will have a healthier garden and save yourself money on water bills. And you won’t have to be wondering which plants to ignore. There are many drip irrigation systems to choose from that vary depending on type of planting, such as annual veggies versus woody trees and shrubs. Drip Irrigation slowly delivers water to the roots. DK: Soil type is also very important when we’re considering water absorption, right? JM: Yes, knowing your soil is essential for gardeners! Different types have different needs and will hold the water differently. Sandy soil absorbs water quickly but doesn’t hold it. Drip irrigation emitters need to be closer together cause the water doesn’t spread out as wide. Clay soil absorbs slowly and holds the water longer so use low-flow emitters, water longer, and water less frequently. Water less when it is cloudy. Plants under house eaves and on the western and southern side of house dry out faster. DK: And adding more organic material to the soil will help it to retain more moisture, correct? JM: Yes, Add compost to the soil; it acts like a sponge. Also compost tea will encourage healthy soil microbes. It even encourages microbes that will protect the plant roots from disease pathogens entering. 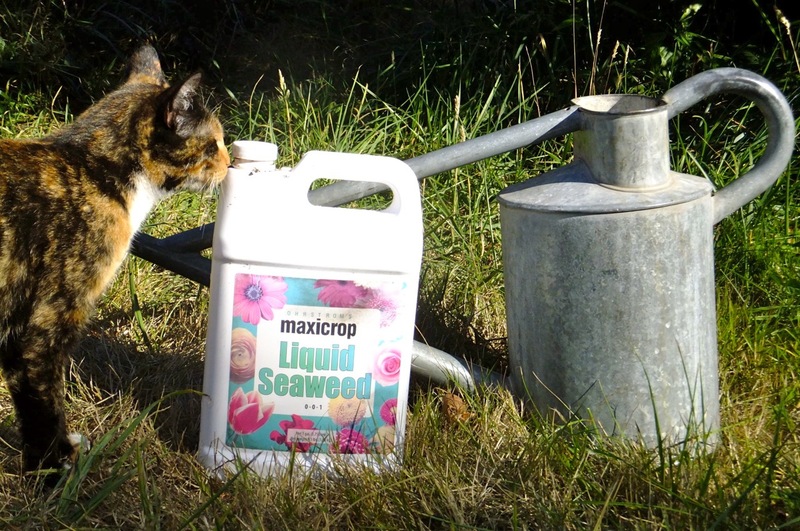 Watering plants with a solution of seaweed extract increases their ability to withstand drought stress, because it adds micronutrients and feeds the soil microbes growing around the roots. These beneficial microbes protect the plant from pathogens. DK: What about mulch? Perhaps we should have you start with the definition of what “mulch” is! JM: Mulch is something that covers the surface of garden soil to retain moisture, prevent weeds, and improve soil fertility. It can also be used to visually tie the garden together. Although sometimes rocks are used, mulch is usually organic matter. If you are decide to mulch now, make sure you water deeply, then add 3-4 inches of mulch around shrubs and small trees. Leave a well around the trunks because wet mulch touching the trunk can encourage fungal disease. Think of placing the mulch in a donut around trunks not a volcano! Place 2 inches mulch around perennials. Mulch with wood chips, chipped branches and leaves, dairy manure, compost, or bark mulch. Another way to mulch is use the plants fallen leaves, the surrounding weeds and any prunings or trimmings as rough mulch. If I do this, I like to cut them up fine so they breakdown faster. Always check to make sure water is reaching the roots. DK: So the things that we’ve spoken about thus far are all things that we can do to help plants that are already in the landscape- what would you suggest for our listeners that are wishing to renovate their garden with native species that are more drought tolerant? Where you live, including how much rainfall and what type of soil is on the site. What you do on the property and how much space you have. Although we live in the PNW, much of PT and north end of Quimper Peninsula is in a rainshadow of Olympics with only about 20 inches of rain. Outside of town, especially heading south there is lots more rain. Brinnon and Quilcene get over 50 inches, mostly in winter.Native plants occur in plant communities adapted to conditions such as sunny drier locations or shady dry, shady moist. Get to know your property where the coolest, moist sites are and the driest spots that get full afternoon sun. JM: Yes, there are definitely microclimates on each site. For example, soil on the western and southern side of a house dry out faster. You don’t have to wait for a couple of years, if you want to get started, you can purchase plants and grow them in your own little nursery. Then transplant them next fall. Make sure you protect them from deer! Always research what a plants need and understand your site. I like to remember: Right Plant Right Place. Some moisture-demanding plants like rhodies, azaleas and ferns need to be watered more often no matter what. Plant drought tolerant native shrubs and water them in for the first couple of years. Make a basin of dirt walls around the plant to hold more water. DK: A common error, that I have sadly made myself on multiple occasions, is to think that because a plant in “native” to our area, that it does not need to be babied somewhat during its first couple of years in a new landscape. I have lost several fine native seedlings by planting them and not keeping them properly watered for the two or three years that they usually need to get established! JM: One thing I like to remind people of is when we see a shrub in the woods; maybe 30 or 40 other seedlings that started at the same time didn’t make it. These are tough little plants that rooted in the decayed leaf litter and slowly grew roots down. Nursery plants have lived a coddled existence, the rooting medium is not too wet or too dry not, protected from freezing, they have been regularly watered and fertilized. In fact, that newly transplanted flowering currant is so tender and lush, that it is like lettuce for the deer. But that is another subject! One thing to remember is drought tolerant plants don’t necessarily prefer hot, dry weather but they can withstand a certain amount. Woody plants are more tolerant than herbaceous perennials because they can store moisture in woody tissue and roots. Herbaceous plants suffer more. DK: Which native plants species would you recommend? JM: For most homes in town that have small lots choose plants that will not get too big. 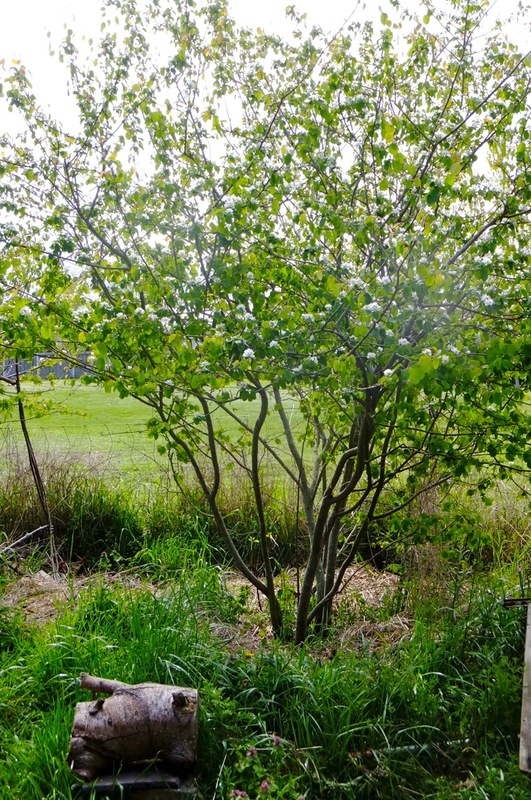 Instead of planting large native trees think of shrubs or small, multi-trunk trees. 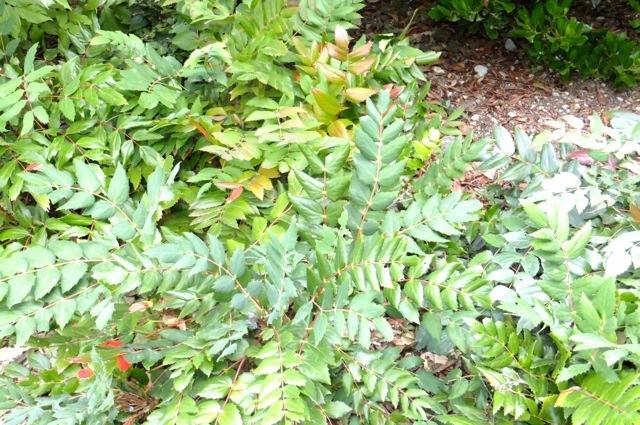 Without deer fencing: 2 kinds of Oregon grape, sword fern, shore pine, soapberry or Shephardia. 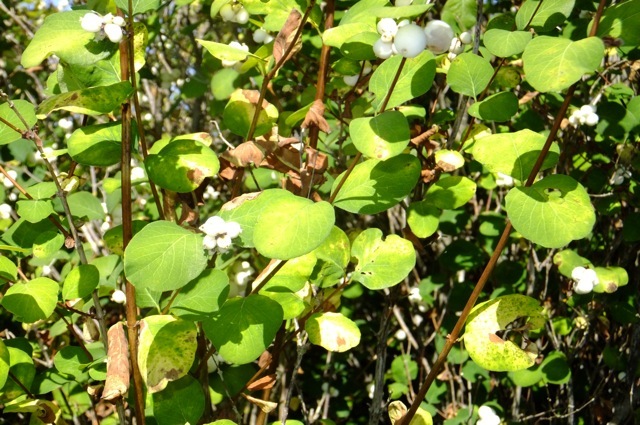 Large gardens can include salal. This wonderful plant is slow to get established but once it does the gardener always needs to control it from spreading into other plants and pathways.